In the grand scheme of things, social media hasn’t been around for very long. But, there’s no denying that it has evolved leaps and bounds in that relatively short amount of time. When social media first hit the scene, many brands viewed it as just another advertising outlet. As a result, their posts were almost always blatantly promotional. Here’s a blurry photo of my product and all of the reasons that you should buy it right now. You definitely don’t see as much of that anymore, do you? That’s because as the social media landscape has shifted, brands have had to elevate their strategies. Now, it’s less about obvious promotions and pushy sales messages, and more about telling a story, establishing a relationship, and eliciting an emotional response from your followers. How do the best brands do that? Through social media storytelling. Social media storytelling is exactly what it sounds like—using text, photos, videos, and other elements to craft a narrative, rather than simply presenting facts or a product. Why is this so effective? As humans, we connect with stories. They resonate with us emotionally. And, as it turns out, emotions are a big influencer in terms of what we purchase. Studies show that the emotional response to an ad influences a person’s intention to buy way more than the ad itself. Dawn dish soap provides a perfect example of the power of storytelling. At first glance, it’s just dish soap, right? It cleans your dishes—simple as that. 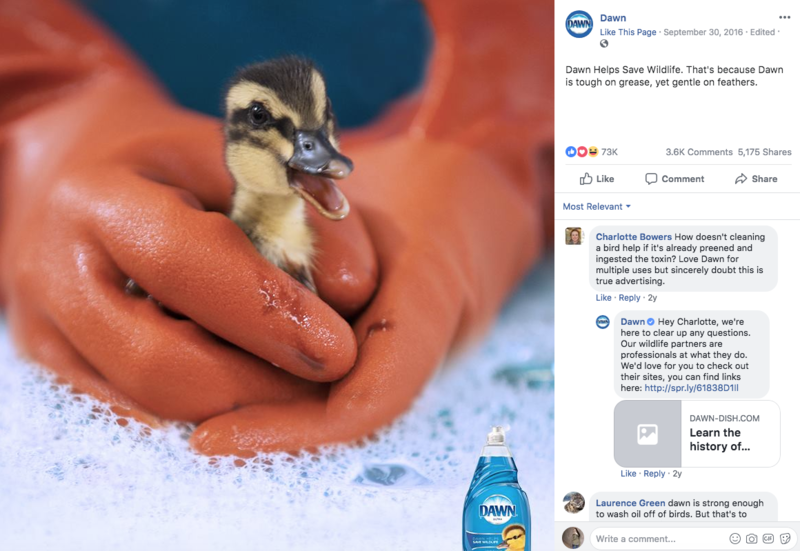 However, Dawn went beyond that in their marketing efforts by frequently showcasing how their product is used to clean up wildlife that’s impacted by oil spills. Those adorable animals and that undeniable good deed tug at our heartstrings, and that emotional response subconsciously increases our fondness for and loyalty to that product. Just how effective is this sort of emotion-centered approach? Well, according to an analysis conducted by the Institute of Practitioners in Advertising (IPA), it’s very effective. In looking at over 1,400 case studies, the analysis found that advertising campaigns with purely emotional content performed about twice as well as those with only rational content. Needless to say, while social media isn’t used strictly for advertising, brands are increasingly recognizing the importance of injecting emotion into their content in order to engage with their followers and boost sales. Finding the right balance with social media storytelling can be challenging. You want your posts to strike a chord and resonate, but you also don’t want to seem slimy or like you’re using a cheap tactic.